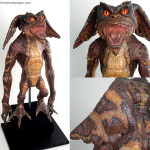 Don’t get him wet, keep him out of bright light, and never feed him after midnight. 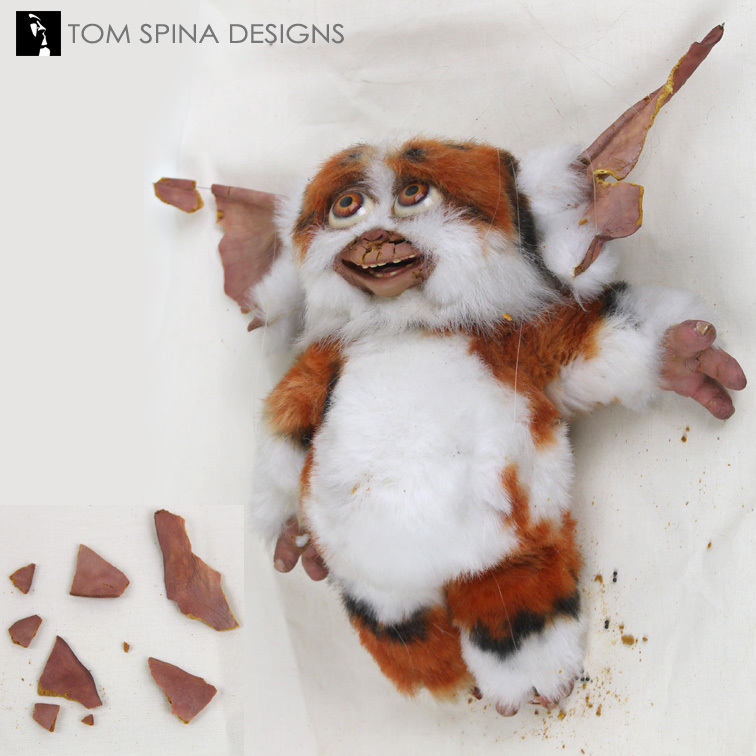 Restoration and custom display of a Gremlins Daffy puppet. We were tasked with repairing this movie Gremlins Daffy puppet and creating a custom display for the cute little Mogwai. His foam latex ears had been damaged over time, and his mouth, hands and feet all had cracking to address. We also needed to come up with a custom display for Daffy because he was a marionette puppet with the strings and controller still attached. Our first job was to rebuild the missing areas of his ears. We carefully added as little material as possible and endeavored to not only recreate the missing areas but to strengthen and attach the remaining material too. As always, we made sure our new patches matched the original, aged material. We were cautious to make sure that the new and original material blended seamlessly. 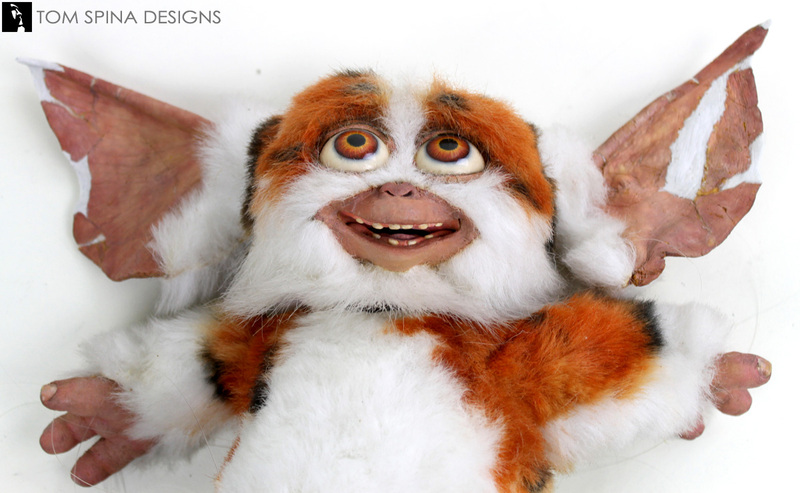 The furry Mogwai movie prop also had a few other areas which had cracked on his face, hands and feet so we addressed all of these areas too. 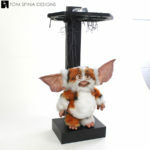 Once he had been completely patched we began the painstaking process of painting the new material to match the original. As always, we only paint the patches, keeping the original paint intact and untouched. 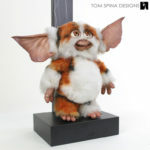 Since this Daffy Mogwai puppet was a marionette, we also had the challenge of dealing with his heavy wooden controller when it came time to display him. Over time his marionette strings had also become tangled which added another challenge. Each piece of fishing line was carefully removed from the controller un tangled, adjusted and then reattached. When every string had been re-strung we created a display base. 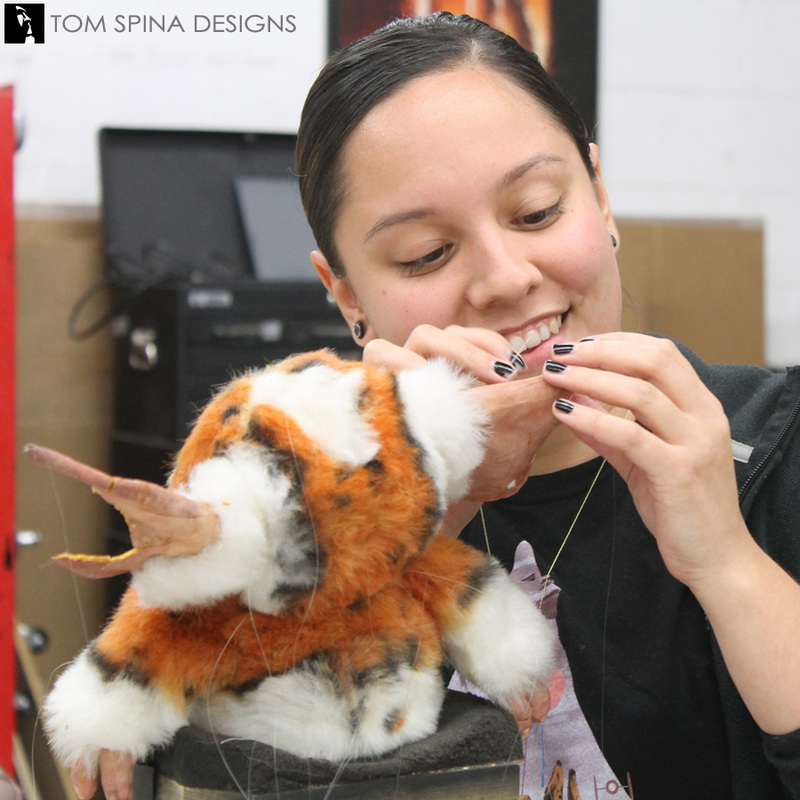 Since hanging the fragile foam prop from his handle would have put too much pressure and stress on the puppet, we designed a stand which carefully supported his body with a separate mount to support the controller. 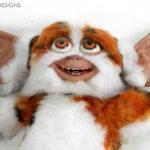 This way he would look like he was hanging with out any pressure being put on the delicate, aging movie prop puppet. 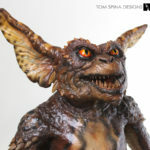 Now if only we could keep him from eating after midnight! 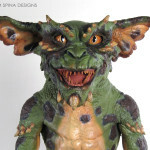 Click here to see more of our other Gremlin movie prop restorations! 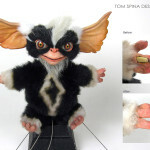 Have an original movie or television prop in need of conservation or display? Email or call today and let’s discuss your project!